Freshen up my hair color for the new season. I’m so excited to show you my hair update! Recently, I lightened up my dark hair to blend in more seamlessly with my highlights that grew out over the months. I also decided to document the before and after on video, below! As with every hair change, it’s always a bit unnerving. After consulting with Tre, I was glad to see he understood what I liked and came up with a great solution to brighten up the hair around my face without it being drastic. It’s nice to know I was in good hands. What we ended up doing was lighten my strands with a highlighting technique called balayage (more natural) and darken up my ends a bit to blend. I was so surprised at how light my hair got in one sitting. Currently, my hair still feels pretty healthy and smooth, so I’m really happy about that. 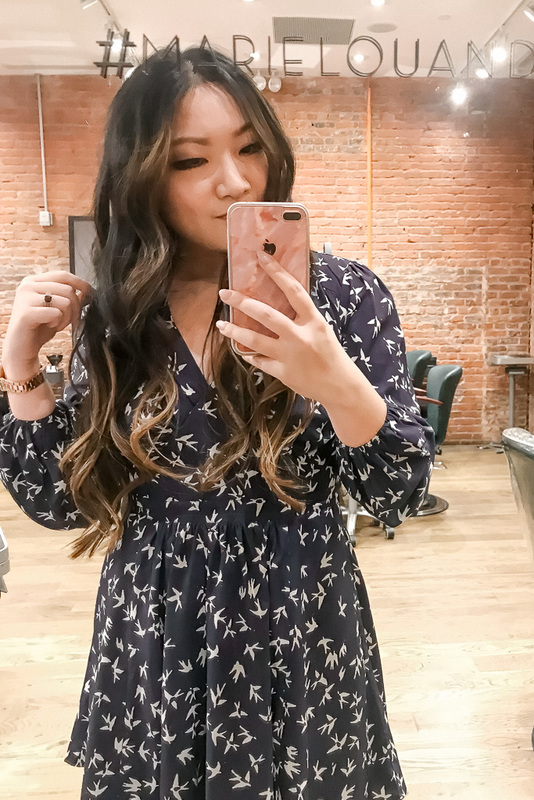 He also trimmed my hair a bit so we got rid of a lot of the dead ends and gave me some amazing curls using a 1.5″ barrel. I ended up loving the results so much! Now, I need to get myself a curling iron of that size. I currently only have a few 1″ barrels and 1.75″, lol. Extreme ends of the spectrum, I know. The photo on the left is a photo taken right after everything was completed. I wish it was still light outside when we finished so I could’ve taken a better photo, but winter is coming — the sun goes down so early. Many thanks to Marie-Lou & D and Tre for making my hair looking so good!